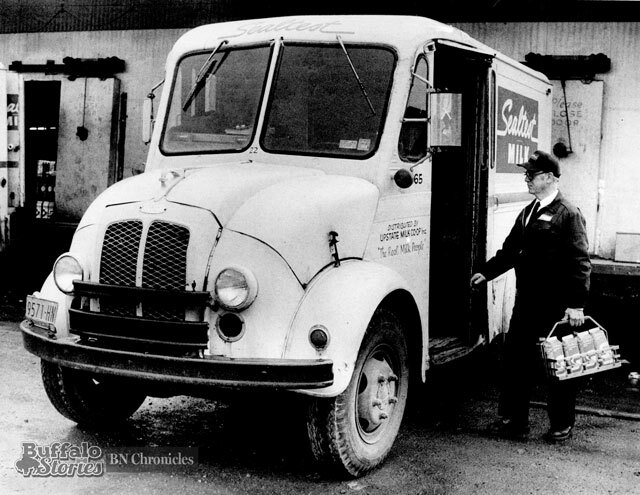 Remember when the milk man used to deliver the milk right to your back door? 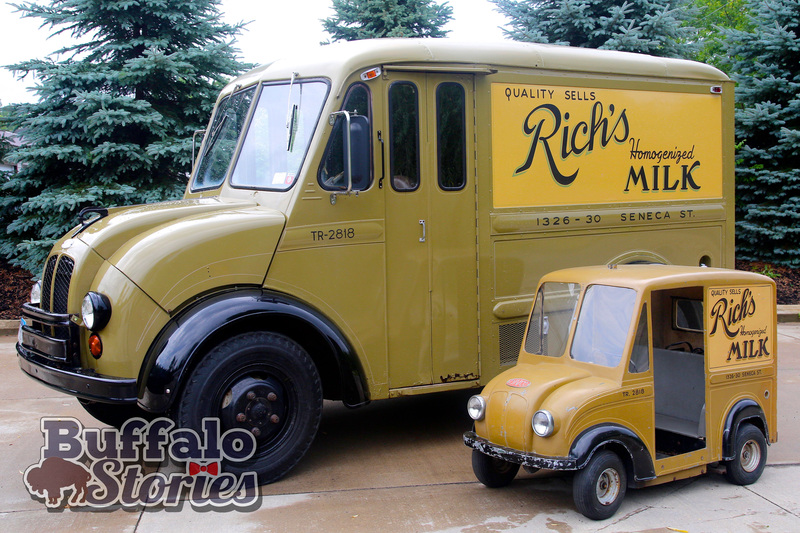 Trucks like this restored Rich’s Dairy truck will be on display in Hamburg next weekend. 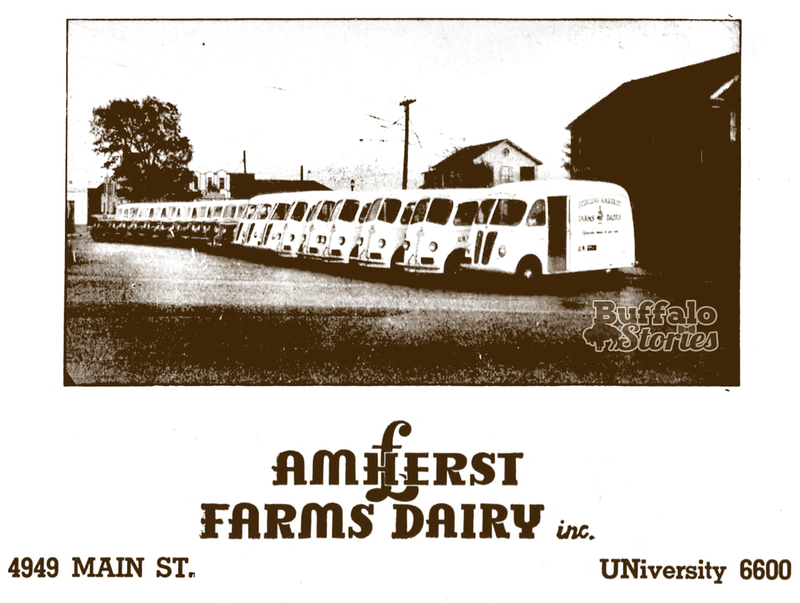 Well, the people who collect the trucks our milkmen used to drive are getting together in WNY next week. 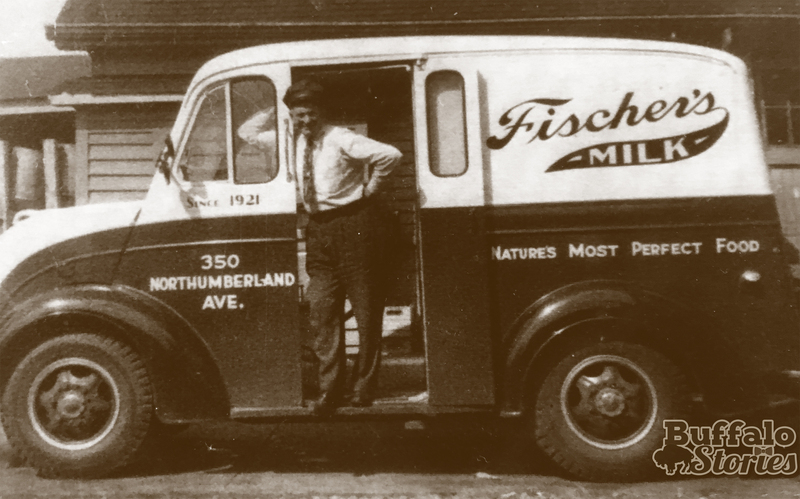 Fischer’s Milk delivery in a Divco truck in the 1950s. 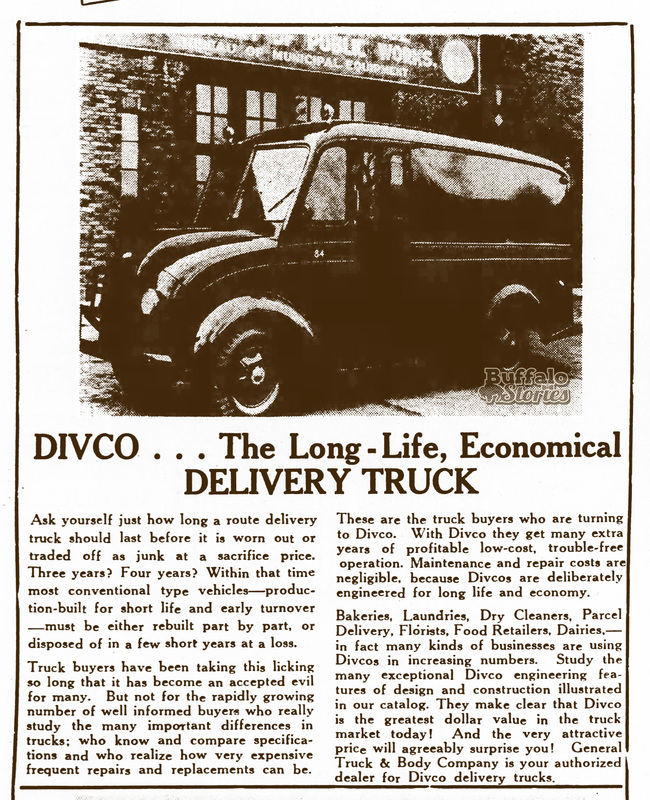 The Divco Club of America will be holding it’s 2018 convention in Hamburg starting next week, and their trucks will be on display at the Hamburger Festival on July 21st. 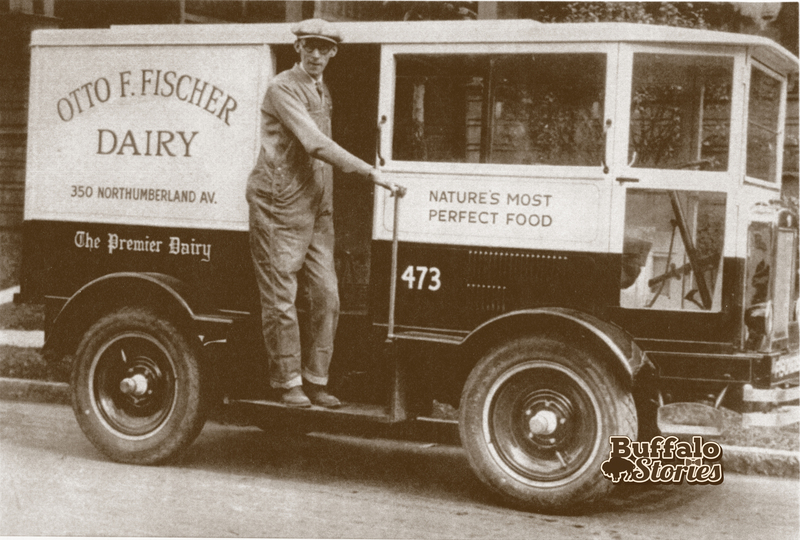 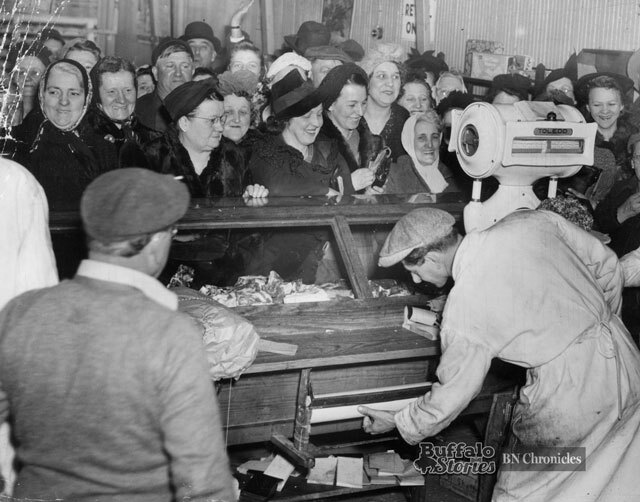 Delivering Fischer’s Milk in a 1930s Divco. 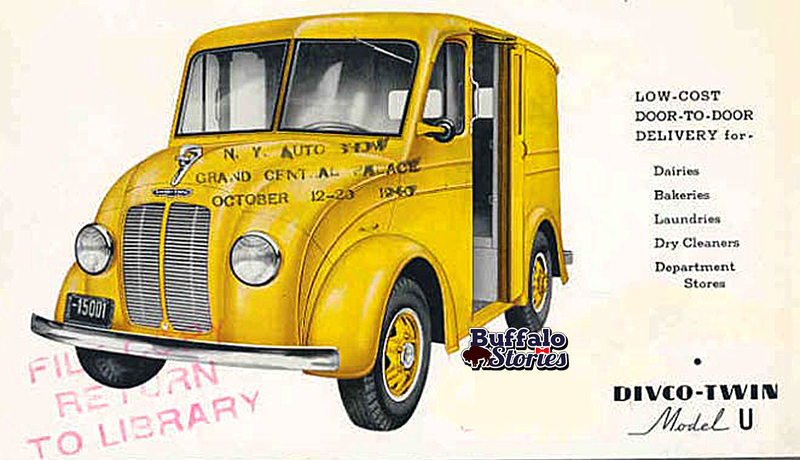 Divco trucks were seen all over WNY and all around the country starting in the 1920s, and used for milk and bread deliveries. 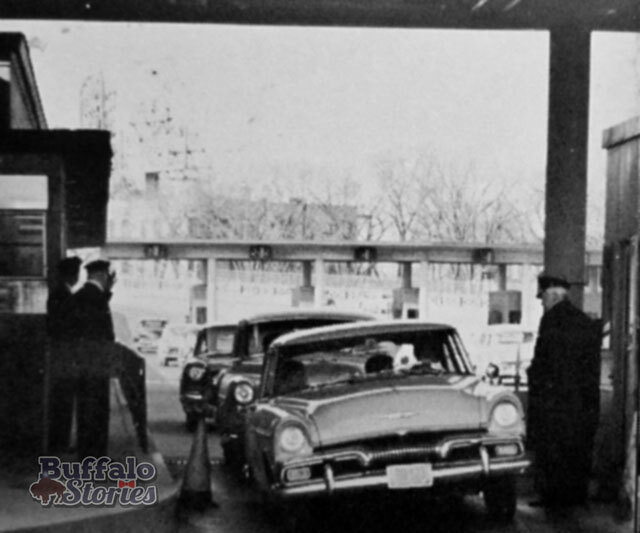 It was in March 30, 1982, that Carl Heim made one last era-ending trip through the streets of Buffalo. 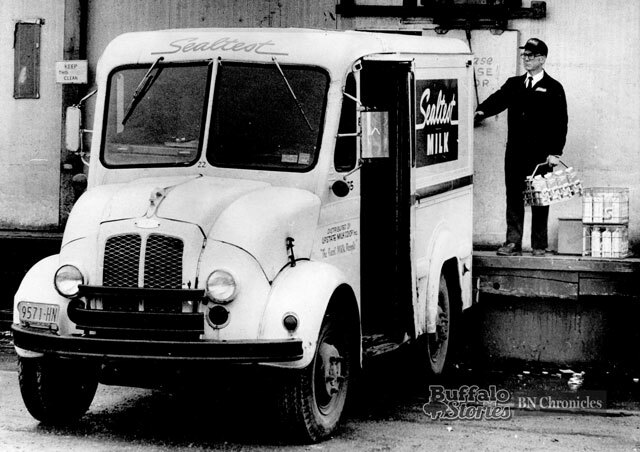 The cartons shown being loaded into this truck were the last home-delivered milk from Upstate Milk Cooperatives, the area’s largest dairy supplier. 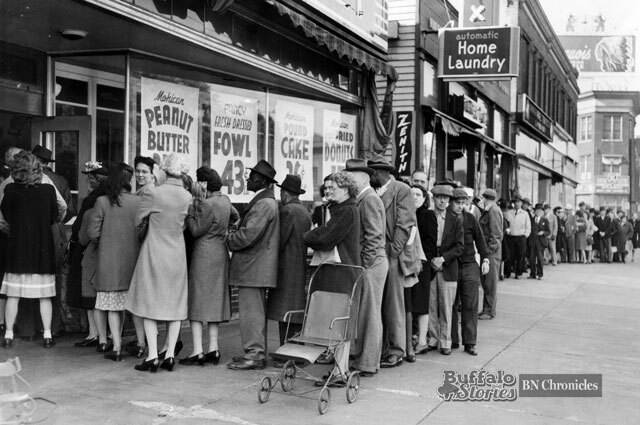 Upstate, which sold the Sealtest brand, was the last of the big dairies to end home service, though several smaller dairies vowed to continue. 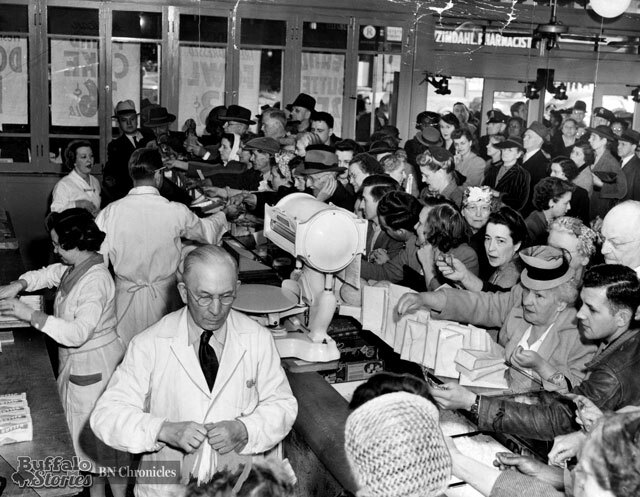 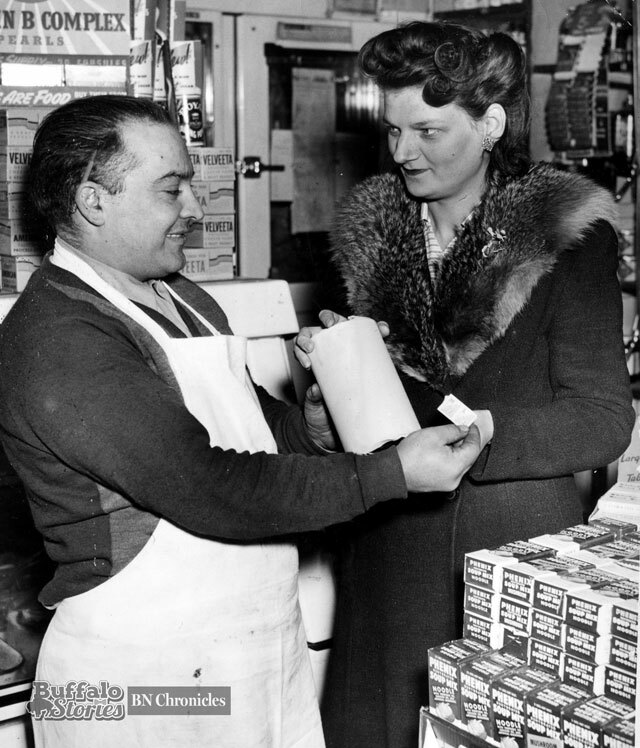 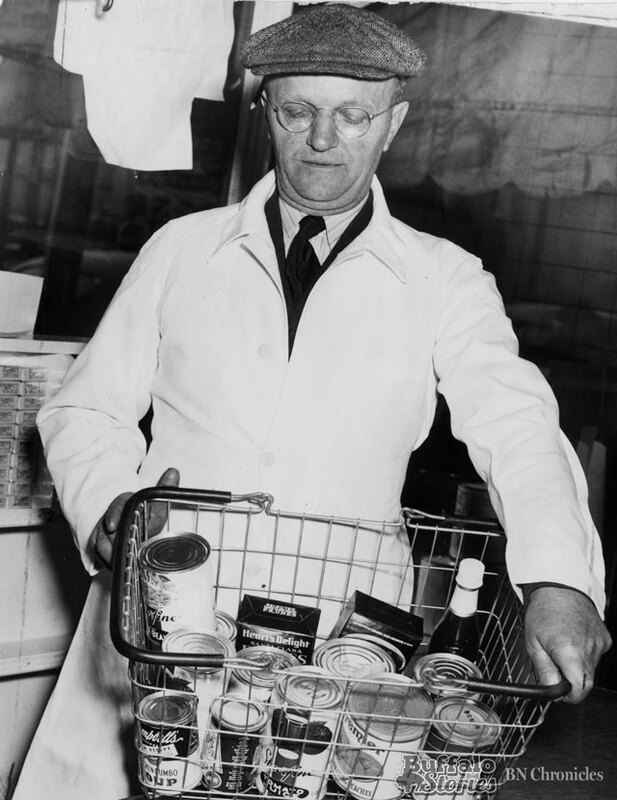 The biggest factor in dropping service to Buffalo’s side and back doors was the growing disparity between the premium cost of delivered milk and the increasingly cheaper prices being charged by large grocery stores. 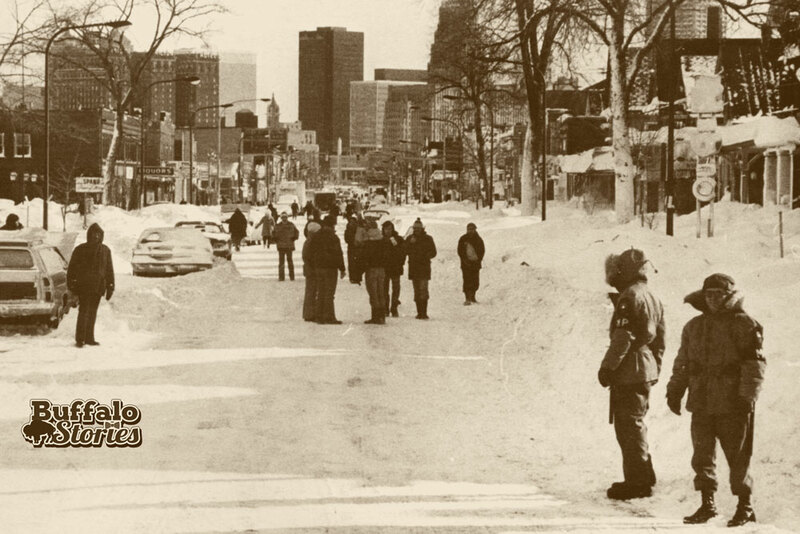 Lines at the Peace Bridge are nothing new, but the scenery has changed through the years. 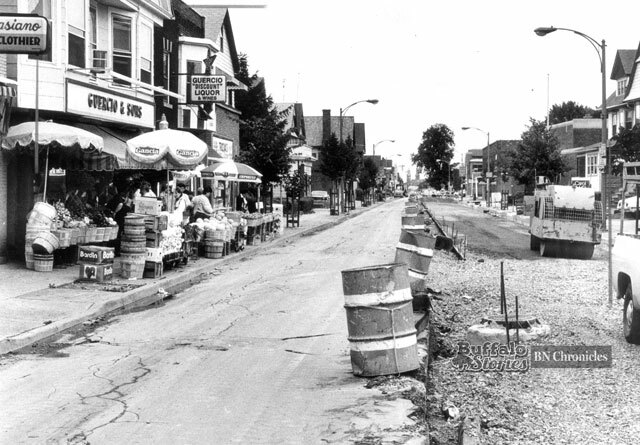 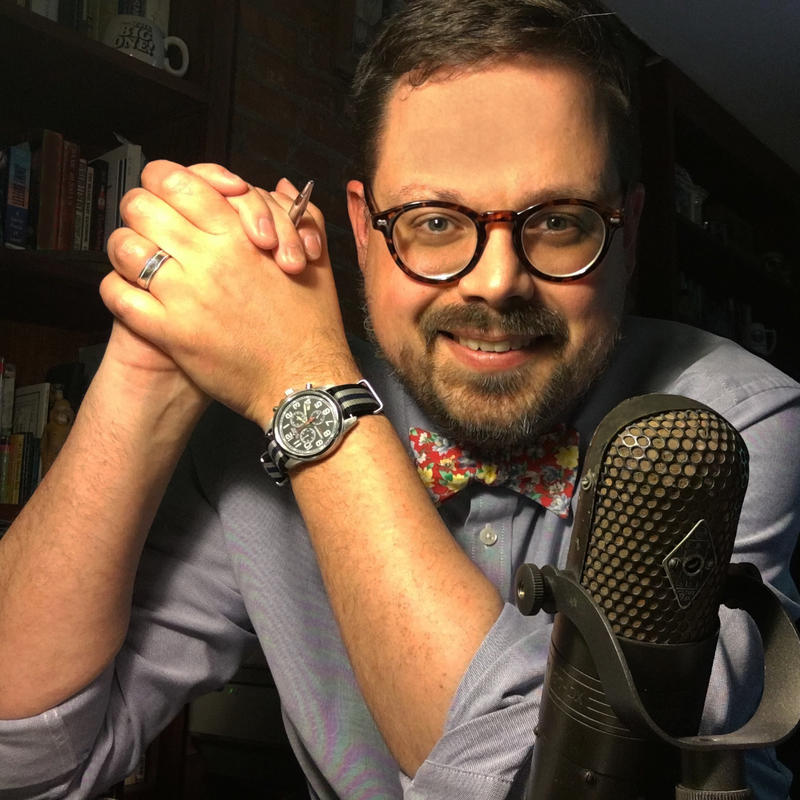 Even when the toll was a quarter and the most evasive question you’d be asked was “Where do you live?,” the backups still felt like forever after a weekend of fun at the cottage or on the Comet. 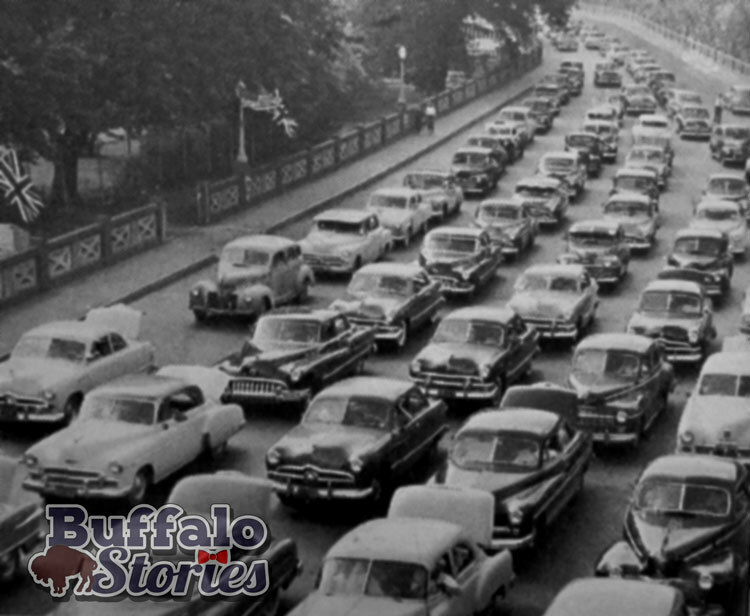 While the cars were queued up in the 1950s, they were bathed in the glow of neon. 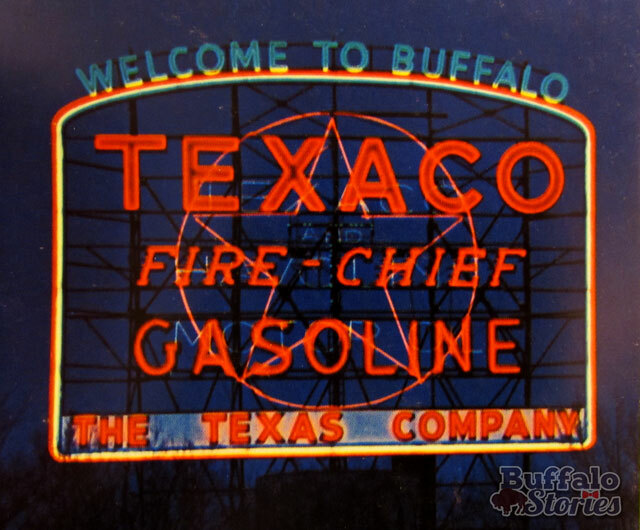 Monstrous iconic signs from Texaco Gasoline and O’Keefe Ale and Old Vienna Beer greeted international travelers to and fro during an age when crossing the bridge was a friendlier and less intrusive experience. 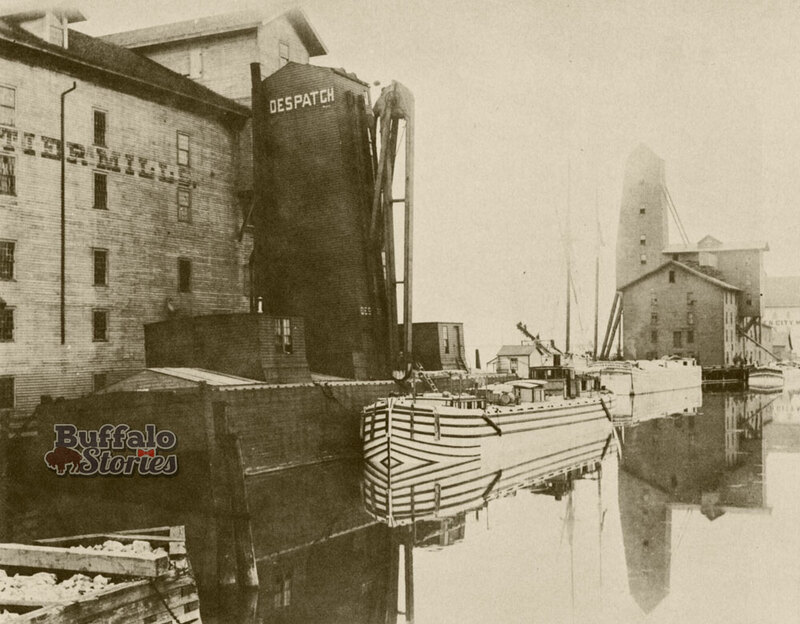 As Texaco shouted “Welcome to Buffalo” in light, O’Keefe and OV advertised what were then two of the Dominion of Canada’s most popular beers. 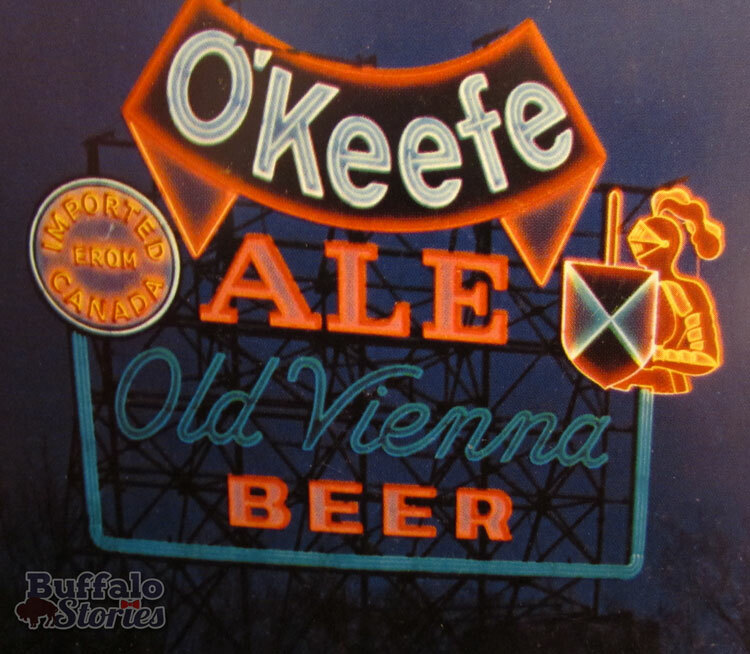 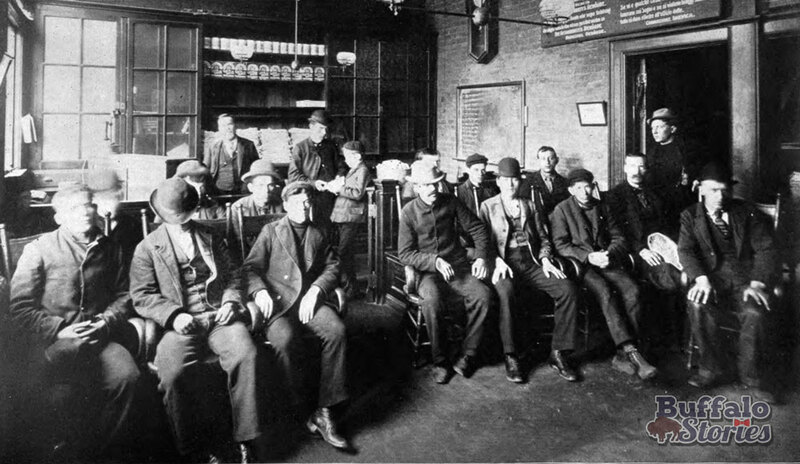 Old Vienna remained a blue-collar Buffalo favorite through the 1980s, with many taverns offering specials on OV splits — Old Vienna beer in 7-ounce bottles. 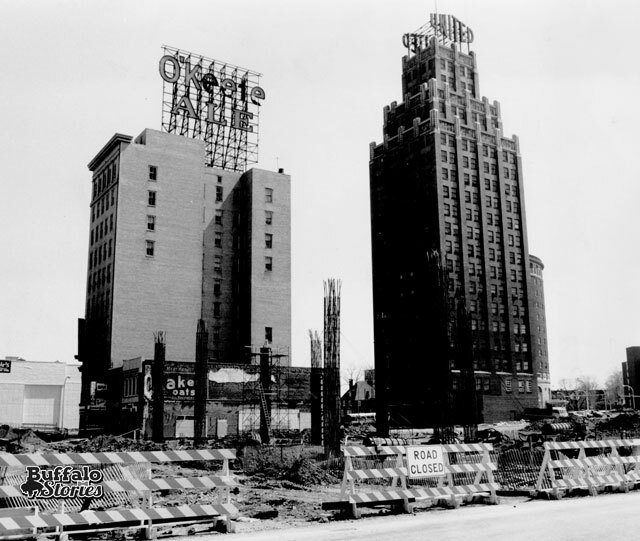 An O’Keefe sign also graced the top of the Hancock Building in Niagara Falls. 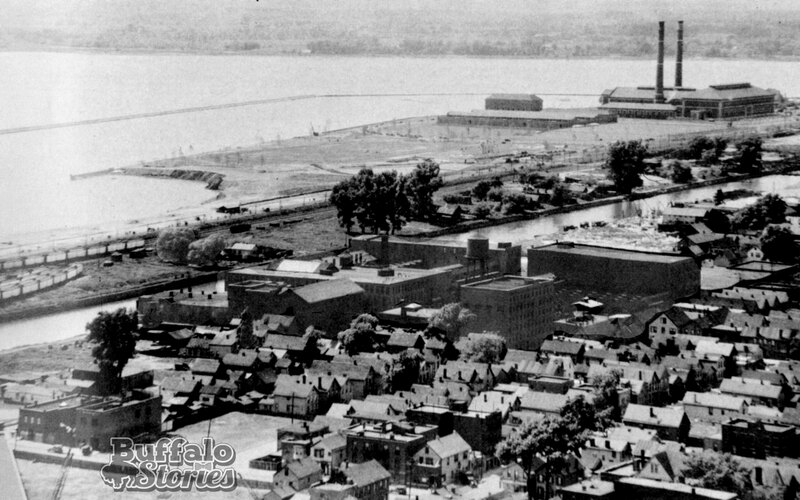 What we now know as LaSalle Park was a canal-side dumping ground before it was developed into parkland in celebration of Buffalo’s 100th year as a city. 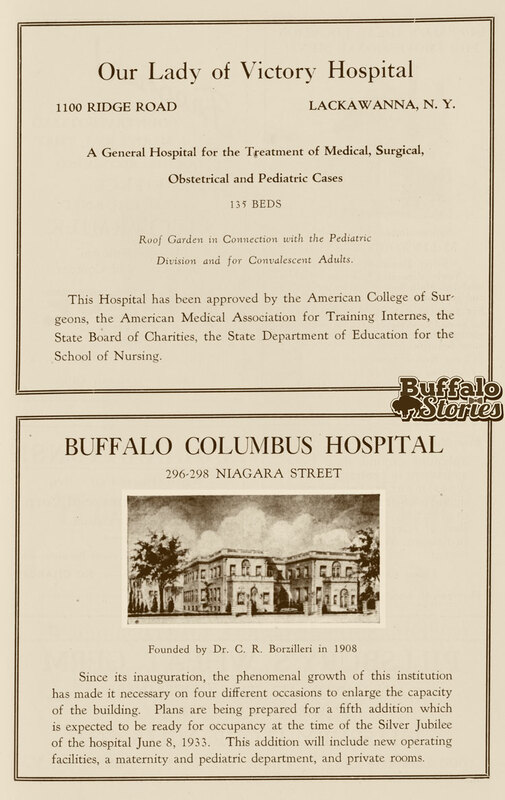 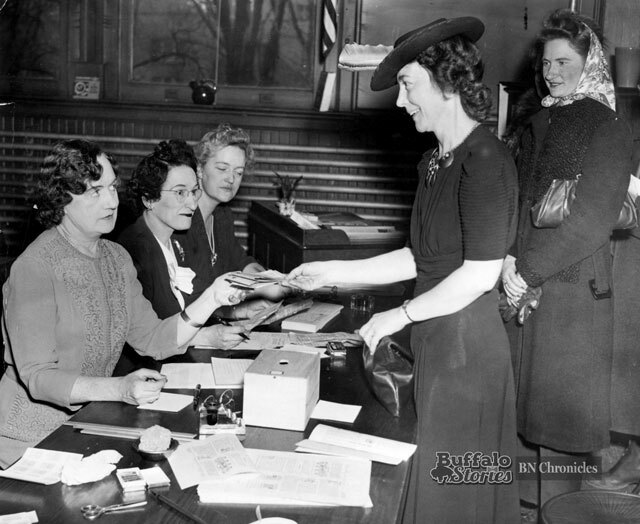 Twenty years after the million-dollar purchase of the lands were made, the area between the Erie Canal and Niagara River on Buffalo’s West Side was finally christened Centennial Park in 1932. 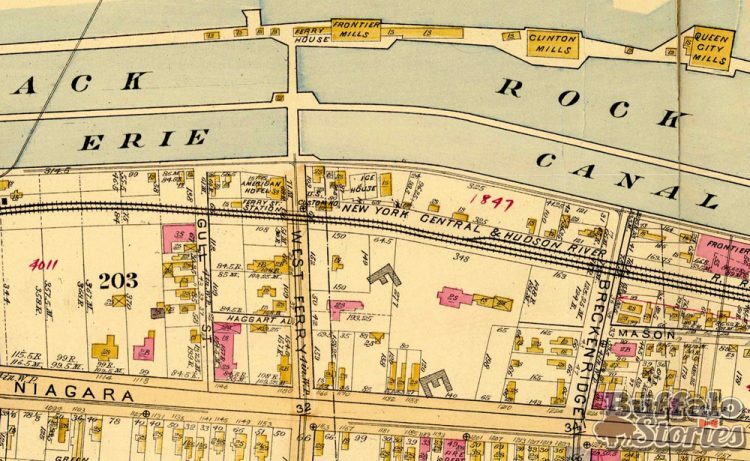 The best reference for figuring out what you’re looking at here is the Col. Frank Ward Pumping Station, which still sits at the northern end of LaSalle Park. The portion of the Erie Canal shown in this view — likely taken from Buffalo’s then-new City Hall looking north — has since been replaced with the I-190. 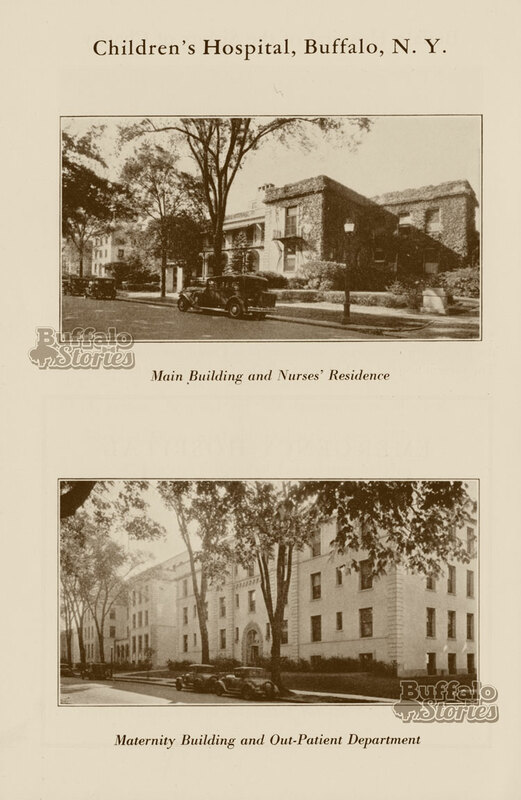 Dr. Ray V. Pierce’s Palace Hotel brought taste and opulence to the West Side spot now occupied by D’Youville College. 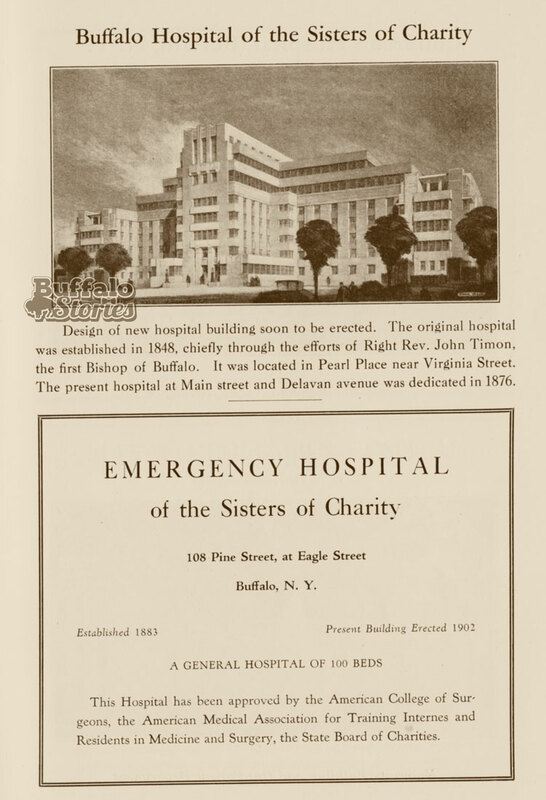 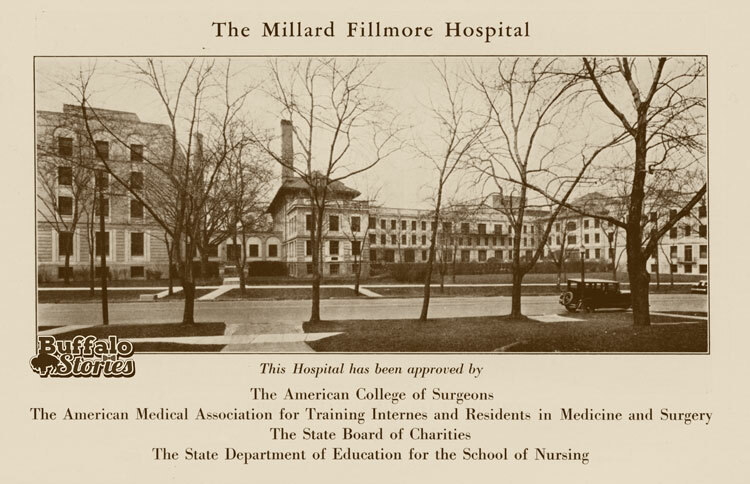 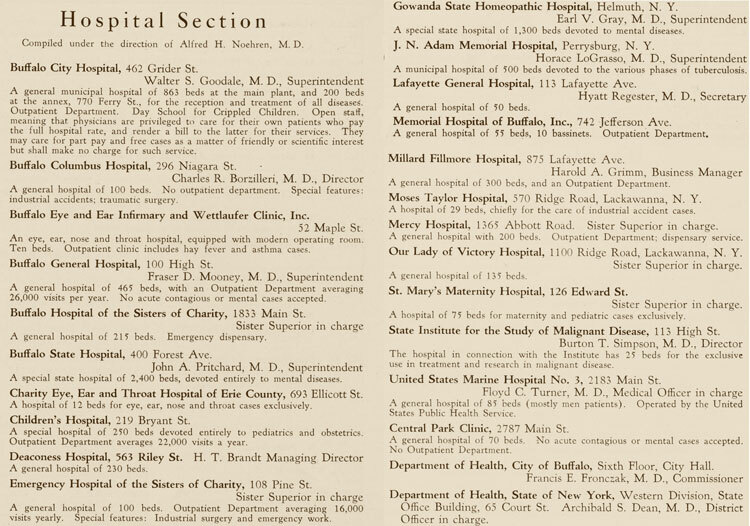 Opened in 1877, the place was half hotel, half hospital. 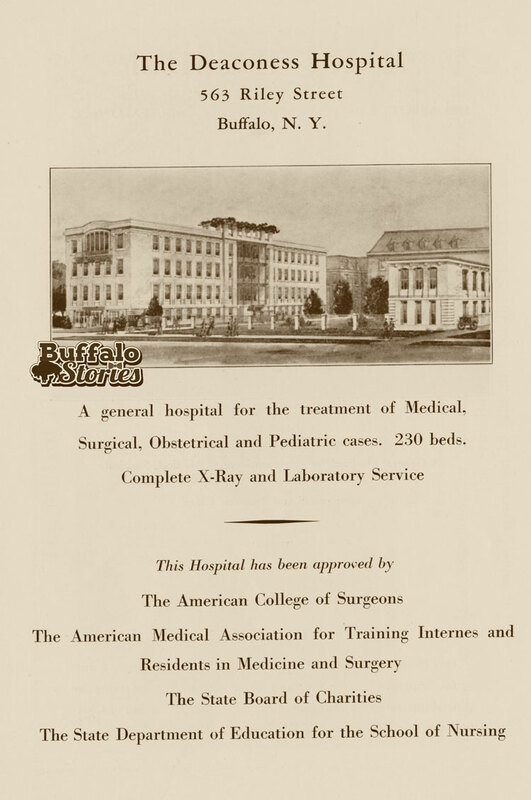 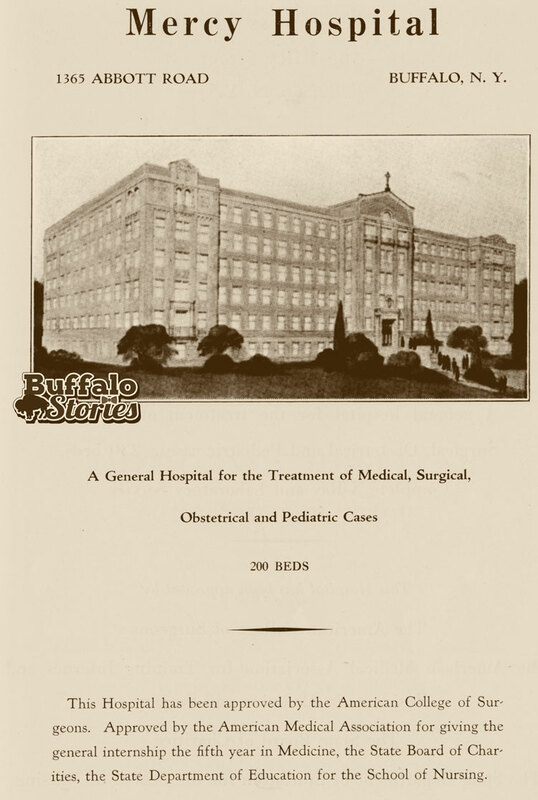 Two generations of Pierces were known for the sale of patent medicines and the cutting-edge “curing” of disease. 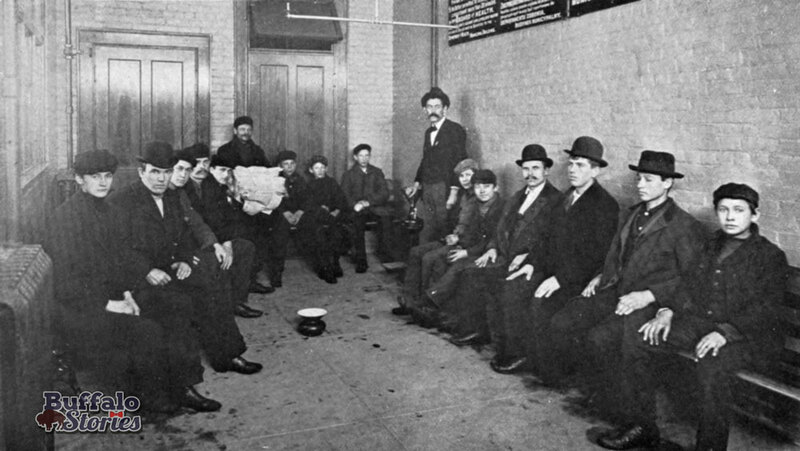 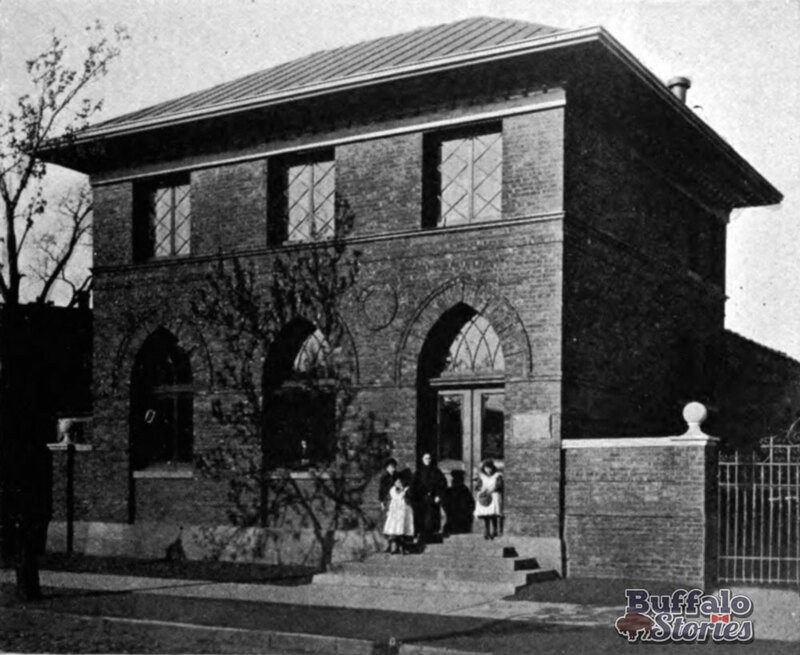 The baths and gymnasiums on the campus were known nationwide for their healing and restorative powers. 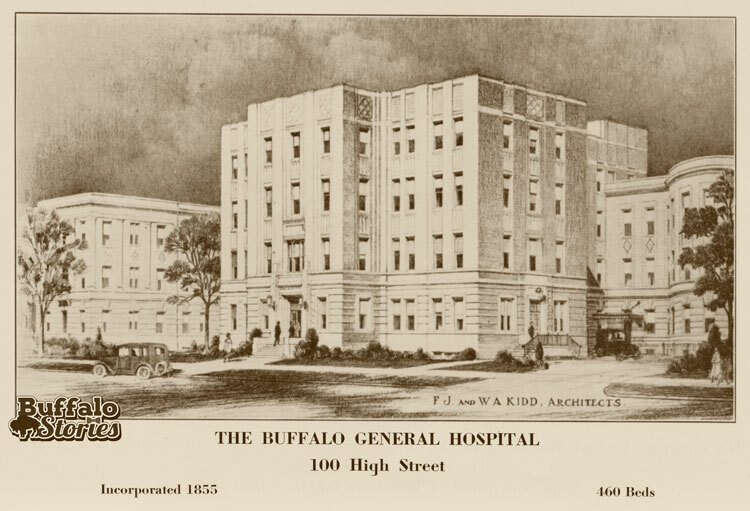 It was from the Prospect Avenue balcony of the Palace Hotel that Buffalo industrialist Frank Baird introduced Gen. James Garfield to Buffalo shortly before he was elected president in 1880. 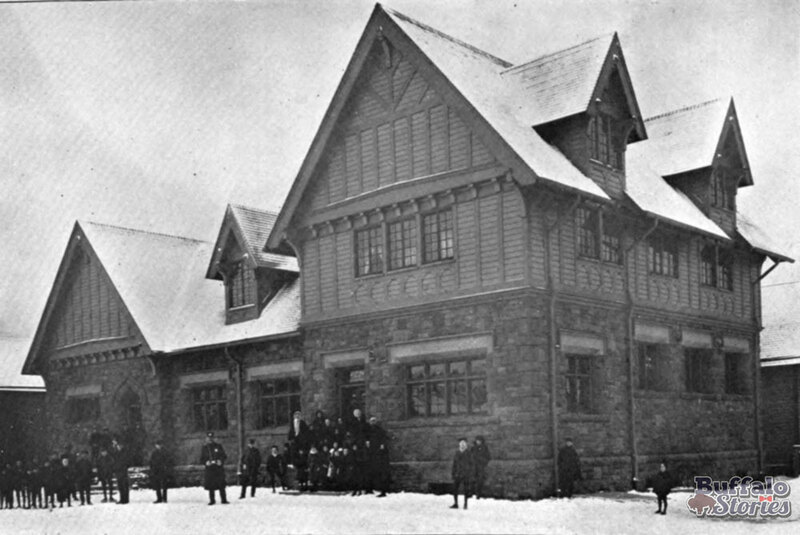 The throng of people welcoming the candidate stretched from the Central Depot at Terrace and Court (behind today’s City Hall) all the way to the hotel. 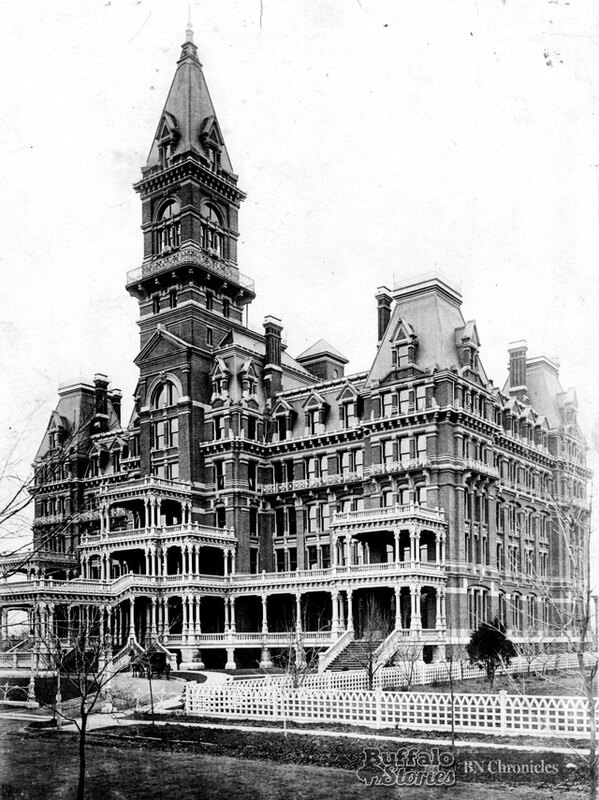 President Ulysses S. Grant was also a guest at the Palace. 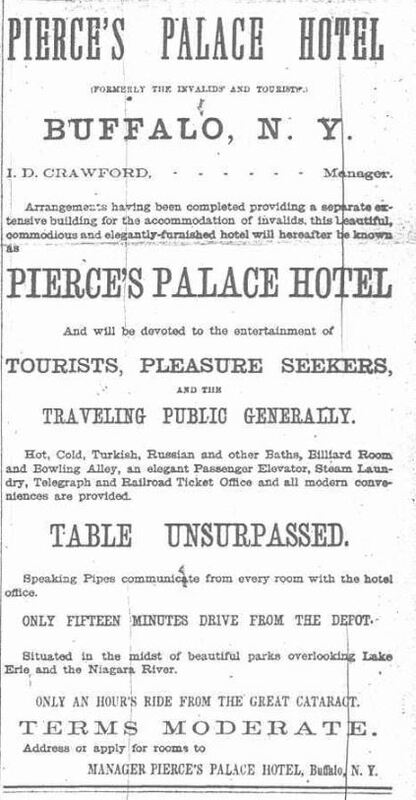 Pierce’s Palace Hotel was open only four years before it burned down in 1881. 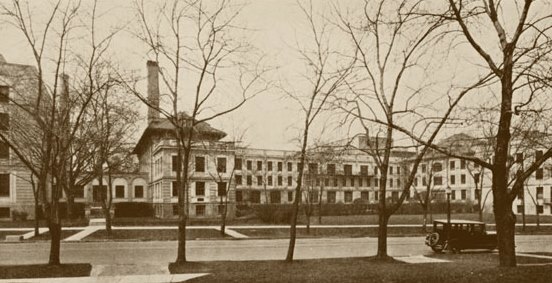 After that, Pierce opened his Invalids Hotel and Surgical Institute on the 600 block of Main Street; that survived until 1941.